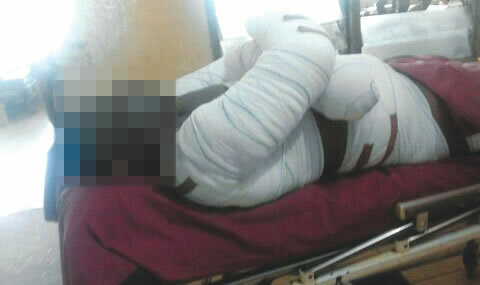 A Reverend Father with a Catholic diocese in Anambra State (names withheld), who was allegedly burnt by a cooking gas fire in a lover’s house at Allen Avenue, Awka, has been,reportedly, flown abroad for treatment. Our source, who pleaded anonymity, said the lover died in the inferno while the Reverend Father sustained high degree of burnt. “Your inquiry isn’t exactly false. His (Reverend Father’s) relative is a friend and he did not say anything different from your proposed report,” the source said. It was gathered that the priest was relaxing in a one-room apartment of the alleged girlfriend (who was identified as a student of a university in the state) on the fateful day when the incident occurred. “The girl died on the spot, but the priest was hurriedly smuggled away and we now hear that they have flown him abroad, apparently to cover traces. Are there no hospitals in Nigeria? “I have told them to stop covering this story. What do they want to achieve by hiding this story? The truth should be said and shame the devil,” the source maintained. When Abuchi, Onwumelu, the Press Secretary to the Bishop of the Diocese, Most Reverend Paulinus Ezeokafor, was contacted on the telephone for reaction, he said he had heard about the gas fire incident involving a Reverend Father, but had no full facts of the story. Onwumelu, who said he was in a function when our reporter called him, promised to get back to our correspondent, but he never did by the time of filing the report. Similarly, the state Police Public Relations Officer, Mr. Ali Okechukwu, said the matter had not been reported to his office. He promised to reach the Divisional Police Officer of ‘B’ Division, where the incident allegedly occurred and get back to our correspondent, but he never did.